Successfully Added DVR Keychain - Car Remote Style (4GB, 30FPS) to your Shopping Cart. 4GB DVR camera in a keychain car remote casing. 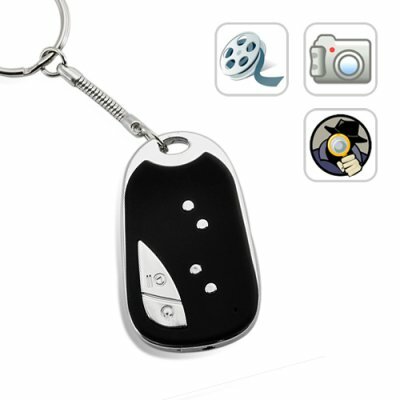 This incredibly discreet camera is disguised as a standard car alarm remote on a keychain. This is the perfect way for aspiring secret agents to capture all the action, in high quality video, and without suspect. What's more, this amazing gadget takes high resolution still photos, smooth 30 frames per second AVI videos, and even records audio too! The I46 comes with 4GB of internal memory so you can remain confident that you will never miss a scene again. Use this undercover gadget to record hours of business meetings or interesting events on unsuspecting people, or to catch your boss or husbands abusive behavior in the act. With the convenient one button operation you can easily capture video on a moments notice, anytime anywhere. Simply press the button to take a photo, or "press and hold" to start recording video, it doesn’t get any easier than this! This device can also be used as a standard Mini DV recorder and still camera for candid shots, but in a highly convenient keychain form factor. In addition, you can easily connect the I46 to your computer via USB for use as a 4GB USB storage drive to store and transfer your important files. Audio and video recording, 4GB USB drive, and still photo capture, the I46 offers it all, and in such a convenient form factor that you can easily keep it with you at all times. Place it on your desk, on a shelf, in the background close by, or attach it your keychain. the I46 it is the perfect covert device and candid audio video recorder for beginners and professionals alike. Add this item to your cart now and never miss a moment again. This product is available for bulk or single piece orders and is in stock and ready for immediate shipping. The CVSD-I46 is proudly presented to you by the leaders in wholesale electronics, Chinavasion! How do you record video with the device? Press the on/off button for about 3 seconds, till the blue LED light appears, the device is now turned on. Then press the record button for about 3 seconds, the blue LED will flash 3 times then stop. This means the device is recording video now and has entered recording mode. Press the record button again, the blue LED light will appear again and the device will stop recording video and save the file. How do you take still photographs with the device? Turn on the device, the blue LED will appear and be solid (not flash). Just press the record button once, the blue LED will flash once to show that it has taken a photo. The image will be saved automatically. The blue LED will flash once every time it takes one photo. How do you set the time of video and images taken with the device? Create a new Txt file on your computer named “Set Time”. Open the file, input the date and time in the following format: year , month, day, hours, minutes and seconds format (for example : 2009.05.18 18:28:23). Then save the text file, connect the device via USB and copy the text file to the root catalog of the device then disconnect the device. Then turn on the device again to record a video as usual; connect to the computer again and you will find the date and time have been changed to the one you had set. on 2010-02-13 20:06:11 The fastest shipping seen in 11 years!